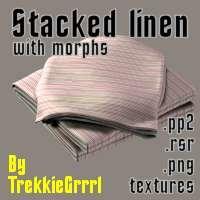 A stack of folded linen, with different morphs. You are making super cool stuff! alessandra (4 years ago) Inappropriate? Thanks much. Used it in the DAZ May Freebie Challenge. Llola Lane (5 years ago) Inappropriate? Yet another useful little thing. Thank you. Thank you. This will add a nice touch to my domestic scenes.